1-13 –Dave Clarke Feat. Chicks On Speed What Was Her Name ? Track 1-2 in the booklet listed as "No Matter What You Do (Sfact Video Edit)"
Track 1-12 in the booklet listed as "Faces (F*** Them All Mix)"
Track 1-13 in the booklet listed as "What Was Her Name? 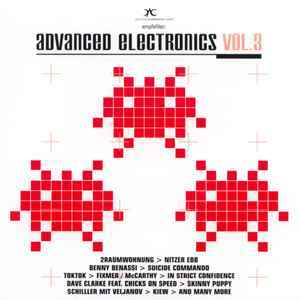 (Original Version)"
Track 1-14 in the booklet listed as "Bang Bang (Radio Version)"
Overall, I've found this to be the best of the three Advanced Electronics albums released at the time. I have found these compilations to be relatively hit-and-miss, and unfortunately, this continues to be the case with this release. However, of all of them, I must commend it on having the greatest number of tracks I find enjoyable. I had heard "Freefall (The Hacker Remix)" in a set by DJ Magal, and recognized it right away. Not a terribly busy song, but still good. 2raumwohnung is back in this release with "Spiel Mit", another good pick after the previous album's "Ich und Elaine". Both "Maschinen (Dis:Connected Remix)" and "Kommanda" I have listened to several times in a row, and I can't seem to get sick of hearing them. They're catchy, and quite good. Finally, I like the track "Star By Star (Apoptygma Berzerk Remix)", as again it is very catchy and sounds well done. Perhaps I have not listened to the other tracks as much as I should, but I'd have to say that nothing else really stands out to me in this release. I think it would be better to find out what songs you like on the album, then purchase and download them rather than buy the whole thing. Capital try, though; better than the first two.